Scientists use concepts and principles that are partly specific for their subject matter, but they also share part of them with colleagues working in different fields. Compare the biological notion of a 'natural kind' with the general notion of 'confirmation' of a hypothesis by certain evidence. Or compare the physical principle of the 'conservation of energy' and the general principle of 'the unity of science'. Scientists agree that all such notions and principles aren't as crystal clear as one might wish. An important task of the philosophy of the special sciences, such as philosophy of physics, of biology and of economics, to mention only a few of the many flourishing examples, is the clarification of such subject specific concepts and principles. Similarly, an important task of 'general' philosophy of science is the clarification of concepts like 'confirmation' and principles like 'the unity of science'. It is evident that clarfication of concepts and principles only makes sense if one tries to do justice, as much as possible, to the actual use of these notions by scientists, without however following this use slavishly. That is, occasionally a philosopher may have good reasons for suggesting to scientists that they should deviate from a standard use. Frequently, this amounts to a plea for differentiation in order to stop debates at cross-purposes due to the conflation of different meanings. 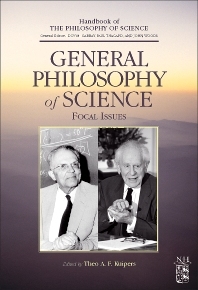 While the special volumes of the series of Handbooks of the Philosophy of Science address topics relative to a specific discipline, this general volume deals with focal issues of a general nature. After an editorial introduction about the dominant method of clarifying concepts and principles in philosophy of science, called explication, the first five chapters deal with the following subjects. Laws, theories, and research programs as units of empirical knowledge (Theo Kuipers), various past and contemporary perspectives on explanation (Stathis Psillos), the evaluation of theories in terms of their virtues (Ilkka Niiniluto), and the role of experiments in the natural sciences, notably physics and biology (Allan Franklin), and their role in the social sciences, notably economics (Wenceslao Gonzalez). In the subsequent three chapters there is even more attention to various positions and methods that philosophers of science and scientists may favor: ontological, epistemological, and methodological positions (James Ladyman), reduction, integration, and the unity of science as aims in the sciences and the humanities (William Bechtel and Andrew Hamilton), and logical, historical and computational approaches to the philosophy of science (Atocha Aliseda and Donald Gillies). The volume concludes with the much debated question of demarcating science from nonscience (Martin Mahner) and the rich European-American history of the philosophy of science in the 20th century (Friedrich Stadler).